No one can do just one thing at a time anymore. In our busy world, multitasking is required. The same thing is true of your iPhone. To help you get the best experience and be the most productive, the iPhone supports multitasking. Traditional multitasking, in the sense that we’ve become accustomed to on desktop computers, means being able to run more than one program at the same time. Multitasking on the iPhone doesn’t quite work that way. Instead, the iPhone allows a few kinds of apps to run in the background while other apps work in the foreground. For the most part, though, iPhone apps are paused when you're not using them and then quickly come back to life when you select them. Instead of offering traditional multitasking, the iPhone uses something Apple calls Fast App Switching. When you click the home button to leave an app (or swipe up on the screen of an iPhone X or newer) and return to the home screen, the app you just left essentially freezes where you were and what you were doing. The next time you return to that app, you pick up where you left off instead of starting over each time. This isn’t really multitasking, but it’s a nice user experience. Multitasking on the iPad is similar to the iPhone, but much more flexible and powerful. To learn how to unlock the power of iPad multitasking, read How to Use The Dock In iOS 11 and iOS 12. Do Suspended Apps Use Battery, Memory, or Other System Resources? There's a persistent belief among many iPhone users that apps that are frozen in the background can drain the phone's battery or use bandwidth. While perhaps that was true at one time, it's not true now. Apple has been explicit about this: apps that are frozen in the background do not use battery life, memory, or use other system resources. For this reason, force quitting apps that aren't in use does not save battery life. In fact, quitting suspended apps can actually harm battery life. There's one exception to the rule that suspended apps don't use resources: apps that support Background App Refresh. In iOS 7 and up, apps that can run in the background are even more sophisticated. That's because the iOS can learn how you use apps using Background App Refresh. If you usually check social media first thing in the morning, the iOS can learn that behavior and update your social media apps a few minutes before you normally check them to ensure that all the latest information is waiting for you. Apps that have this feature turned on do run in the background and do download data when they're in the background. To control Background App Refresh settings, go to Settings > General > Background App Refresh. Music. Listen to the Music app, Pandora, streaming radio, and other music apps while doing other things. Location. Both Apple Maps and Google Maps allow you to get directions and use other apps simultaneously. AirPlay. Apple's technology for streaming audio and video from the iPhone to compatible TVs, stereos, and other devices runs in the background. VoIP (Voice Over IP). Apps like Skype that let you make phone calls over the internet instead of over a cellular network work with other apps. Push Notifications. These notifications let you know something's happened in another app that you may want to check out. Apple News. Content in the Apple News app downloads in the background to ensure you've got the latest news waiting for you. Bluetooth Accessories. When Bluetooth accessories are paired to your iPhone, data may be sent back and forth. Background. As noted above, the Background App Refresh can update certain apps while they're not running. Just because apps in these categories can run in the background doesn't mean they will. The apps have to be written to take advantage of multitasking — but the capability is in the OS and many, maybe even most, apps in these categories can run in the background. 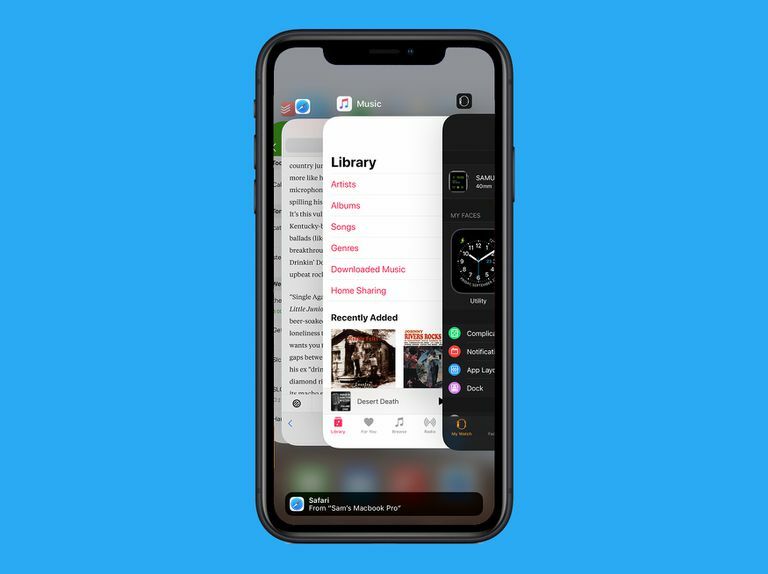 The Fast App Switcher lets you jump between recently used apps. How you access it depends on what iPhone model you have. On iPhone 8 and earlier, quickly double-click the iPhone's home button. On the iPhone X and newer, swipe up from the bottom of the screen (this gesture has replaced the Home button on these models, among other gesture-based shortcuts). In iOS 9 and up, the screen drops back a bit to reveal a carousel of screenshots and app icons for all of your current apps. Swipe left and right to browse apps and then tap the app you want to use. In iOS 7 and 8, the experience is very similar to iOS 9, except that instead of a carousel, you have a flat row of apps. You'll also see shortcuts to frequent contacts at the top of this screen. Otherwise, it works the same way as in iOS 9. In iOS 4–6, most of the screen is grayed out and reveals a set of icons at the bottom. Swipe the icons left and right to see recent apps, then tap an icon to launch that app. Swipe left to right to switch the last app you used. Hard press again to pop into the Fast App Switcher. The Fast App Switcher also lets you quit apps, which is especially useful if an app isn't working properly. Quitting third-party apps that are suspended in the background will stop them functioning until you relaunch them. Quitting Apple's pre-installed apps allows them to continue with background tasks like checking email, but forces them to restart. In iOS 7–12, swipe the app you want to quit off the top edge of the screen. The app disappears and quits. You can quit up to three apps at once by swiping them at the same time. How's that for efficiency? In iOS 4–6, tap and hold an app icon until the icons begin to jiggle and a red badge with a minus sign in it appears on the apps. Tap the red badge to quit that app. You can only quit one app at a time on these versions of the iOS. Apps in the Fast App Switcher are sorted based on what you used most recently. This is done to group your most-used apps together so that you won’t have to swipe too much to find your favorites.